Russian President Vladimir Putin brought singing Cossacks, controversy and his dancing shoes to the wedding of the Austrian foreign minister Saturday. Putin was a surprise guest at the wedding of Karin Kneissl, an independent who was selected for her post by Austria’s pro-Russian far-right party, according to reports. 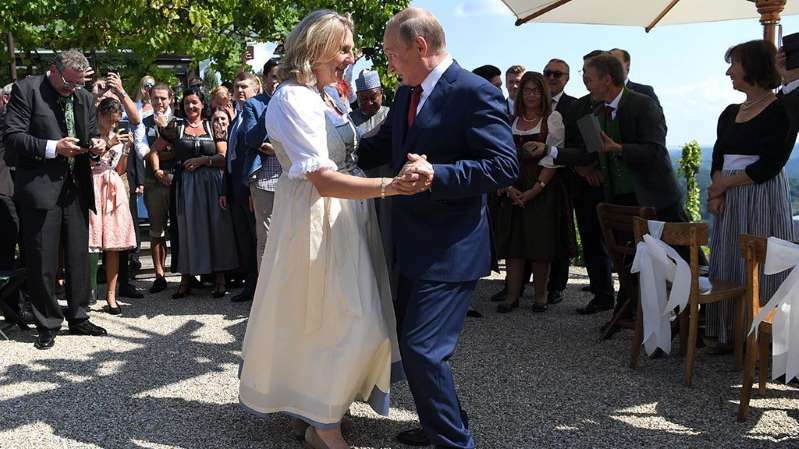 Guests watched as Putin danced with Kneissl who married businessman Wolfgang Meilinger at a vineyard in Austria’s Styria state. Putin warmly greeted the bride, giving her a beautiful bouquet of yellow and white flowers, according to Russian state news agency Tass. He was reportedly invited during a visit to Austria last year. The Russian leader was said to have brought along a troupe of all-signing, all-dancing Cossacks as a wedding gift, Sky News reported. The channel reported that Putin was a controversial guest to what was billed as a private affair that has drawn a lot of criticism from liberal-minded Austrians. Austrian authorities imposed tight security measures around the site of the ceremony, according to the Associated Press. His meeting with Merkel takes place at the German government's guesthouse in Meseberg, north of Berlin. Topics during the bilateral talks include Ukraine, Syria and the planned Nord Stream 2 gas pipeline from Russia to Germany that the United States and some European countries object to. The two leaders planned to make statements before the talks.